Disc locks are amongst the most commonly used anti-theft devices for protecting motorcycles and scooters. Unfortunately, as we have seen, in certain circumstances they can be neutralised relatively easily by unscrewing the disc. The disc locks with an alarm have been developed to also deal with this possible risk. What are the features of these anti-theft devices in terms of mechanics and electronics? Let’s see. Basically, a disc lock with an alarm is equipped with one or more sensors which are able to detect attempted thefts and activate a siren which disturbs the possible thief. 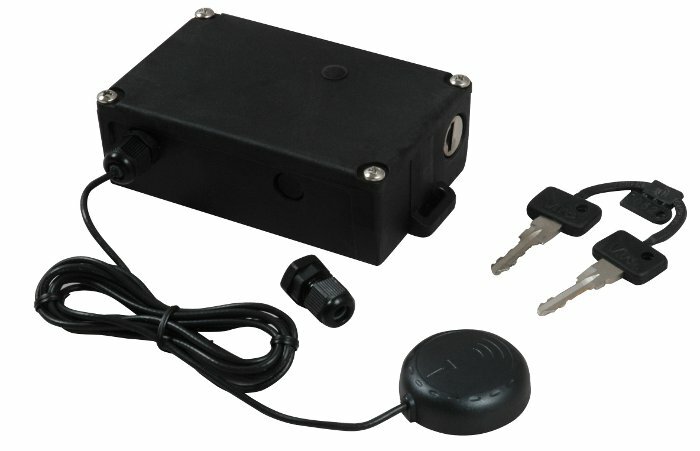 The Viro Echo alarm disc lock, for example, is equipped with a sensor which is able to detect movement of the vehicle, and, therefore, a likely attempt to steal it. The more advanced Viro Sonar is equipped with two sensors, one detecting movement and one detecting vibration. It is therefore able to detect not only attempts to steal the motorcycle, but also attempts to tamper with its protective devices, including the disc lock. 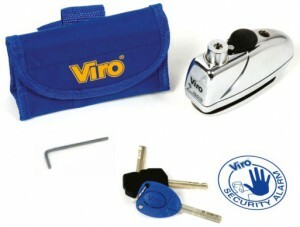 The Viro Sonar alarm disc lock. A disc lock with an alarm is therefore able to also signal attempts to circumvent it by unscrewing the disc; for this reason, it represents a decisive step forward from the point of view of security with respect to a common disc lock. Naturally, not all alarm disc lock are the same. Indeed, precisely the presence of an electronic component means that there are many imported products in this category which are made cheaply and are not able to ensure adequate protection. The compartment which houses the electronics protected against the weather, otherwise one storm would be enough to put it out of action. The Viro alarm disc locks, for example, have the compartments housing the electronic certified in accordance with IEC 60529 as resistant to water splashes and dust. An operation based on low energy consumption technology, otherwise the need to change the batteries become too frequent, resulting in a high risk of flat batteries. The siren positioned inside the disc lock, or in any case in such a way that it cannot be easily neutralised, for example by injecting it with polyurethane foam. The small size of a disc lock only allows it to hold small batteries; consequently the output of the siren certainly cannot be at the level of an alarm connected to a car battery. If a product claims to have a siren with a large output then doubts over its seriousness or the duration of its batteries are quite legitimate. The sound of the siren can therefore be heard within a limited range, and certainly less than that of common household and vehicle anti-theft devices. Its function is not so much to alert the owner, who may very far away, as to attract the attention of passers-by to the possible thief, in order to disturb the activities. Like all sirens, that of a disc lock can also be neutralised if it can be reached. The most commonly used method is to inject polyurethane foam used in building works inside the siren, so as to block it. For this reason, it is important that the mouth of the siren is positioned so that it is not easily accessible. One of the best locations is inside the slot where the disc brake is inserted, so that once the disc lock is assembled on the disk the space for action is minimal and does not leave room for manoeuvre. In the same way as for the common disc lock, there remains the limit of not being able to anchor the vehicle to a fixed point and therefore the impossibility of preventing removal by force, for example by loading the motorcycle on a van. 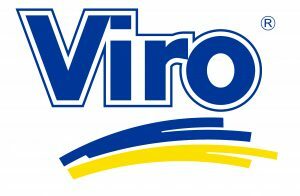 The Viro Sonar alarm disc lock is designed to integrate with the Viro MAS satellite anti-theft module. In this way, if the disc lock detects an attempted theft it can send text messages in real time using the GSM module of the anti-theft device, whilst, if the latter detects an attempted theft it can sound the siren of the disc lock. Viro MAS GPS / GSM satellite anti-theft module. Disc locks with an alarm allows some typical limitations of disc locks to be overcome and thus represent an important step forward from the point of view of security. Combined with a GSM/GPS alarm such as the Viro MAS and/or a good padlock with chain they are able to offer maximum protection. This entry was posted in Motorbikes and Bicycles and tagged products on 15 June 2015 by Mara Rossi.